The Big Brown Bat is found all across the U.S., maybe even in your own yard! As bats go, Big Brown Bats are, well, big. But, don’t be afraid of them. They aren’t aggressive and they’re a gardener’s friend, helping to keep beetle pests and other nocturnal flying insects under control. Their body is 4 ½ to 5 inches long and they have a wingspan of almost 14 inches. Still, an adult weighs next to nothing — about 1/2- to 3/4-ounce. They have a large head, large eyes, broad nose and ears that are medium-sized and rounded. Their coat is glossy and brown, but the shade can vary from brown to reddish-brown to chocolate. Their underside is slightly lighter. The face and ears are bare. Their tail extends slightly beyond the tail membrane. Big Brown Bats (Eptesicus fuscus) originally preferred deciduous forests, but have proven themselves adaptable, now living in nearly every kind of habitat — from forests to meadows to deserts — with no strong preference for feeding near water like many other bat species do. They range from Alaska and central Canada throughout the U.S. and as far south as northern South America. Big Brown Bats hibernate six months or so of the year, from late fall until spring when insects are available for food. Often they leave their summer roost for a winter one. In early summer, females separate from males and form maternity colonies of up to hundreds of individuals. The males roost alone or in separate groups during this time. In late summer, after the young are weaned, both sexes roost together. Big Brown bats are loyal to their places of birth and hibernation and return year after year. The bats rest during daylight hours and take flight just before dusk to begin foraging. (They’ll also come out in the daytime if they’re sorely in need of water or food.) Like most other U.S. bats, they’re insect eaters, with flying beetles being a favorite. They identify their prey by the sounds made by their wings. By midnight they’ve often taken their fill and are back in their roost. Big Brown Bats roost in such places as hollow trees, storm sewers, rock crevices, under loose bark and other places: Loss of “snag” trees in urban areas (dead or decaying trees — the kind we call an eyesore and chop right down) encourages, even forces, the bats to take up lodging in buildings if there’s no suitable alternative. These days, having become comfortably citified, they willingly take up residence in sheds, attics, chimneys, under eaves or even behind shutters. The only invitation they need is a tiny opening and a promise of darkened, warm surroundings. For this reason, they’re the ones most likely to be noticed by humans. 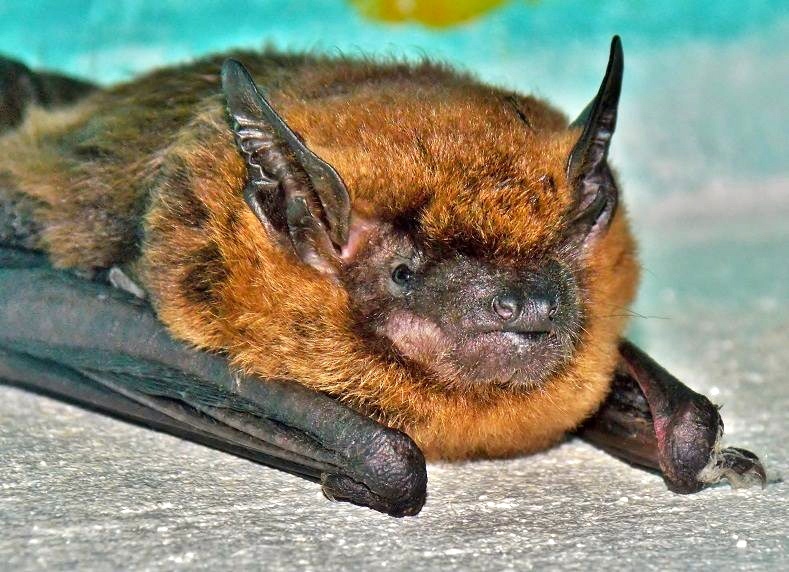 Big Brown Bats, as with most other hibernating bat species, mate in the fall before hibernation (it can also occur during periodic awake periods in the winter). The young are born in mid-to-late June when there are plenty of insects available as food. The gestation period is about 60 days. Mothers leave their pups together in the roost each night. Upon their return, the mothers call out to their babies, who’ll answer back. Each mother can identify her baby’s “voice” and particular scent even in the cluster of dozens or hundreds of other noisy pups. A mother needs to eat her weight in insects every night while she’s nursing to maintain her energy and she’ll leave more than once a night if necessary to get her fill. Young bats, still ignorant of the demands of hibernation, have a 50 percent chance of dying in their first winter because they didn’t store enough body fat. They also face death by predation — climbing critters, such as snakes and raccoons, may get into their roost. Once they begin flying, they must learn to avoid owls and falcons. If they can make it through that perilous first year, they have a chance to live to be 20. Size: Body 4 1/2 – 5 in. ; wingspan 14 in. ; weight 1/2 – 3/4 oz. Lifespan: Up to 20 years. Half die the first year. Range/habitat: Adaptable to all environments. Prefers deciduous forests. Doesn’t need to be near water. Foods: Insects, especially beetles and caddisflies. Cover/nesting: Hollow trees, under loose bark, rock crevices, storm sewers, sheds, attics, chimneys, under eaves, behind shutters. Predators: The very young fall prey to climbing predators, such as snakes, raccoons. When flying, owls, falcons are a threat. Called: Male: male; female: female; young: pups; group: colony.